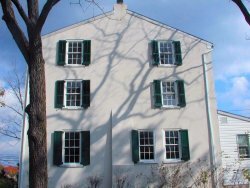 It is not uncommon to have a window somewhere on your home where there is physically not enough room for exterior shutters. It could be that 2 windows are too close like in the picture shown to the left. It could also be that the window is too close to a chimney, the corner of the house or even a porch post. Whatever the reason there are usually a few ways to work around this. The first thing you need to decide is how you will use your exterior shutters. Do you plan to install your exterior shutters on hinges, so that you can open and close them for storm protection or even for routine house maintenance? Or maybe you will bolt them to your house as decorative shutters only. If your exterior shutters will be for decoration only then not having enough room is not a major issue. With decorative shutters you can always go with narrower shutters to fit the wall space that you have. If your exterior shutters will be functional you really will need to make sure that they can open and close without hitting anything. A good way to test this is to cut out a piece of cardboard to the size of your shutters? Next, go to any widows that you think might be tight for room and just pretend it is on hinges while you “open” and “close” the cardboard a few times to check for clearance. If there is not enough room for shutters on both sides of your window one way to work around this is to hinge your exterior shutters together as bifolds. So instead of having 1 shutter on either side of the window you will have 2 shutters on one side only. You can see an example of this in the picture at the top. A Bifold application is also a great way to mount exterior shutters to cover a bay window. Some times the exterior shutters are so close to a chimney or where a wall takes a 90° turn to lay flat. It is traditionally accepted to hinge the shutters like normal and have the shutter on one side just lean against the obstruction. If you look carefully at the picture at top you will see the base support for chimney on the left hand side. To give you a better overall view the picture to the right is of the entire side of the house. With gable windows there is often not enough wall space for the full shutter to lay flat. There are 2 straight forwards ways to handle this layout. Like the picture to the left you can hinge your shutters like normal and just accept the fact that they will hang out a little bit. 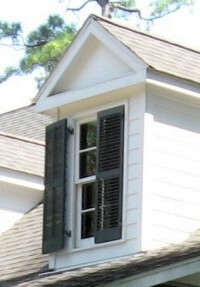 The alternate way is to mount the shutters at the top with hardware designed for Bahama shutters. If you are still unsure how best to size or mount your shutters so that they can open and close, please ask us. Give us a call, send us an email or start an online chat. We are happy to help.